NANAIMO — Hot off the press! 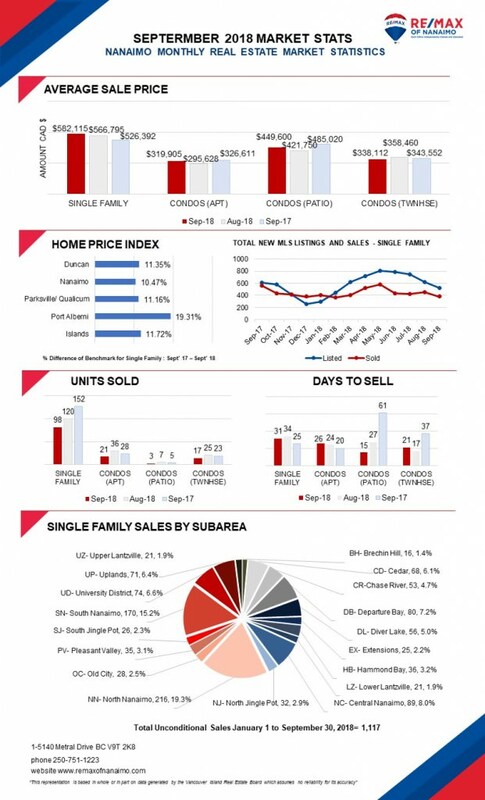 Take a peek at Nanaimo's September 2018 real estate statistics. 511 single-family properties were sold on the MLS® System in September. Sales did decline by 5% from August, which saw 540 single-family homes change hands, but it can be attributed to inventory shortages rather than a cooling market. So, what type of Market is it? With a sales-to-active-listings ratio of around 32%, the VIREB market is firmly in sellers’ territory. In September 2018, the benchmark price of a single-family home in the VIREB area rose to $462,500, that's an 18% increase from one year ago. Also seeing rising benchmark prices board-wide. Apartments and townhouses, up 30% and 23% respectively from 2017.